Hamas and Islamic Jihad warned yesterday they would “respond harshly” to what they described as the killing of Palestinian civilians in Gaza during violent riots along the border on Friday in which four Palestinians died. “The atrocious crimes committed against our people have crossed the red lines and the resistance will not stand by idly,” read a statement issued by Hamas and Islamic Jihad’s joint command. 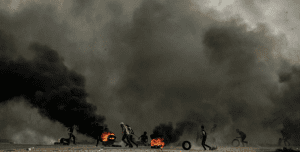 Several thousand Palestinians took part in the so-called March of Return protests on Friday, throwing rocks and incendiary devices at Israeli soldiers along the border and burning tires. The fatalities were the first since last month when Israel and Hamas entered into a de facto ceasefire following a round of hostilities in which the Palestinian factions fired over 450 rockets into southern Israel in a 48-hour period on November 12-13. The flare-up occurred after an Israeli undercover team was exposed in Gaza leading to a firefight in which one Israeli officer and several Palestinians were killed. “It seems that the Zionist enemy misses the rounds of fighting, which will include a harsh response from the resistance that will teach him a lesson and put him in his place,” the statement concluded, adding a call for Gazans to attend this week’s protests on the border.